...what we found in our house today! A lizard. Not the exact lizard in the photo but something like it. Now, growing up in Miami I am used to lizards. They were a very common occurance. In fact, I often would catch them and keep them as pets when I was little. I remember one in particular that I named Samantha. We even had those large beautiful green iguanas roaming our backyard on occasion....the ones that people often buy in pet stores. 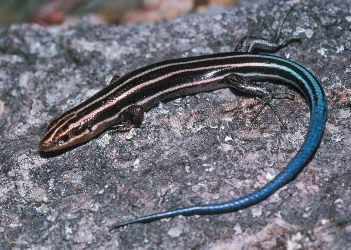 However, in NC we don't see lizards very often...maybe in the coastal areas but not so much in the Piedmont area and definitely not running through our homes. Well, that's what happened this afternoon. My kids saw a lizard running through one of their bedrooms and then underneath a bed. I tried to catch it but it escaped into the wall via a crack in the corner of the room where a small space was open between the baseboard and floor (it was an itty bitty lizard). Honestly, it doesn't really bother me. I like lizards. I would rather have ten lizards in my house than one spider. My husband on the other hand did not like the idea that a lizard was in our walls and might return. He immediately went for the pesticide. I didn't want him to kill the lizard so I convinced him to not spray directly into the crevice and instead he sprayed a little around it. I really hope the lizard doesn't die and that I can eventually catch it and safely return it outdoors. Am I crazy? What's the harm in a tiny non-poisonous lizard?